Leasing Available from $101.80 per month! Boost user productivity and enhance performance with fast A3 printing and copying. Save time and make office tasks more efficient with scan-to-email, digital sending and optional faxing, and a choice of paper-handling and finishing options. An excellent choice for busy departments in large and medium-sized businesses, these MFPs are ideal for workgroups of 30 to 50 users who require fast (and extra fast), high volume, cost-effective printing and copying with digital sending, scanning, optional faxing, and professional finishing. Simplify everyday office tasks and save valuable time. Work efficiently and simplify office tasks with an intuitive touch-screen control panel, and fast print and copy speeds of up to 40 ppm/up to 50 ppm. Send and receive faxes easily and save time with scan-to-email and digital sending. Increase user productivity and improve performance. Boost productivity and improve performance with a range of features which include paper handling and professional finishing options, and advanced solutions like document capture, job accounting and authentication. 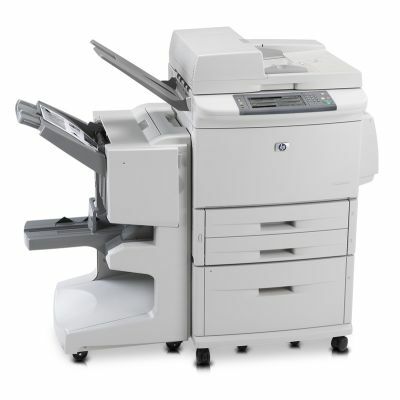 Count on these HP LaserJet MFPs to deliver a consistently reliable experience. Count on these MFPs to deliver industry-leading HP LaserJet reliability. Achieve consistent results with Original HP supplies. HP Web Jetadmin enables proactive fleet management and HP Jetdirect networking assures easy sharing in large workgroups. Print Speed Footnote All printed pages originate from the default tray of a HP LaserJet 9040/9050mfp with a High-Capacity Input (HCI) Tray 4. Power Consumption Footnote Power reported is highest values measured for printing and copying using all standard voltages.